Bronze bar, 50mm x 19mm x 3mm. 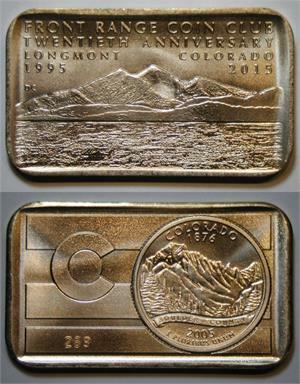 2015 Front Range Coin Club (Longmont Colorado) 20th anniversary medal. With counter-stamped 3-digit serial number below flag. (Random numbers, ranging from about 065 to 315 - many numbers were skipped and never produced.) All counter-stamping was performed while the bar was resting in the die, so as to prevent deformation of the opposite side. Brilliant bronze, no serial number: 90. Brilliant bronze, 3-digit serial number: 110. Brilliant silver, 1st issue without "II": 102. Brilliant silver, 2nd issue with "II" counter-stamp: 75. Antiqued silver, 2nd issue with "II" counter-stamp: 26. Non-PVC "filp" holder. Note: These are not issued with any sort of certificate. NOTE: These medals were first offered to club members only. Now that all club members have had a chance to get some, the remainders are now being offered to the general public. 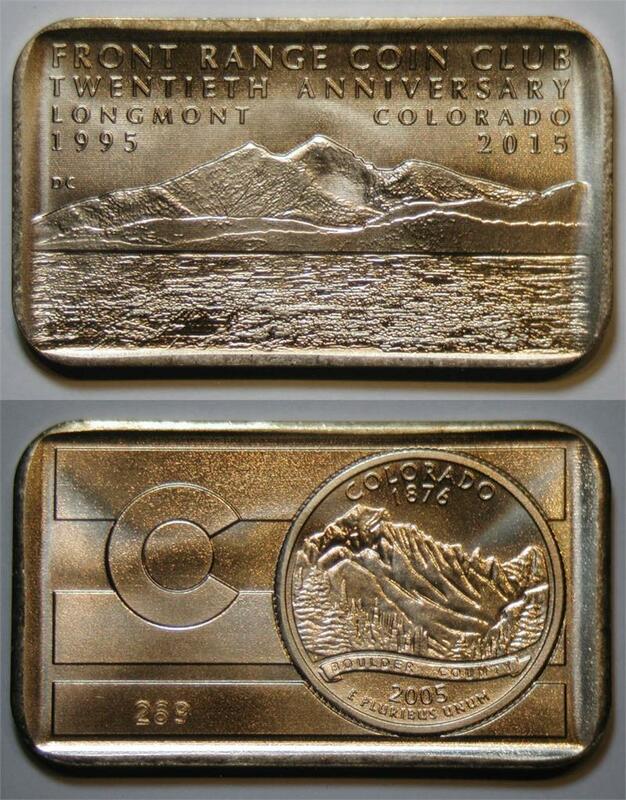 The obverse is a depiction of Longs Peak with the city of Longmont Colorado below. The reverse shows a portion of the Colorado state flag behind a Colorado state quarter (with "Boulder County" banner and "2005" date).